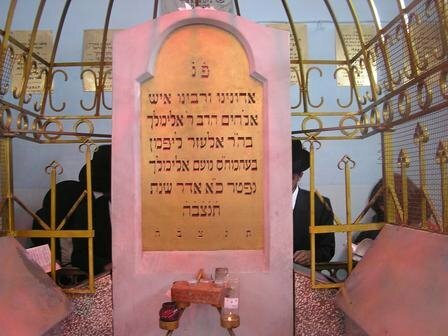 Rabbi Elimelech of Lizhensk was the student of Dov Ber of Mezerich, the brother of Meshulam Zushia of Anipoli. He was born in 1717, and died on 21 Adar in 1786. During the lifetime of Dov Ber of Mezerich he traveled widely with his brother all over Poland to spread Hassidism. After Dov Ber's death, Rebbe Elimelech settled in Lizhensk and attained great fame, thanks to his lofty life. During his lifetime, Lizhensk was turned into a center of Polish-Galician Hassidism. There, many famous Tzadikim and Hassidic activists of Galicia were educated and obtained their inspiration during the 18th century. Rebbe Elimelech is the author of “Noam Elimelech” [Lvov 1798], a book of commentaries on the Pentateuch. In that book, the role of a Tzadik is set out and explained, and the doctrine of Hassidism is explained in greater detail. This book was subject to an intense investigation by the opponents of Hassidism. Many of his expositions are published in his work “Darche Tzedek”, and other works. The Melitzer Rebbe shlit'a, a direct descendant of the "Noam Elimelech", stated that Rebbe Yisroel of Ruzhin said that 500 years before Rebbe Elimelech was born, the world received abundance in his merit. Now, after his death, even more so! It is said that Rabbi Elimelech promised anyone who would visit his grave that they would not leave this world without teshuva. The Torah is eternal and alludes to all events above and below for all generations. Eden alludes to our holy master the Baal Shem Tov. The river was his student the holy Mezitcher Maggid. The garden refers to my brother the Rebbe Elimelech. 4.The Holy Ohev Yisrael the Apta Rav. Rebbe Elimelech had a custom that after the afternoon Mincha service he would converse with his close followers. He would then proceed to a special private room to pray the evening Maariv service alone in seclusion, purity and sanctity. 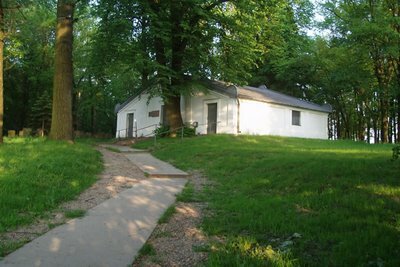 Rabbi Naftali Ropshitzer, a student of the Rebbe always yearned to also be in that room. He constantly wished to see the deeds of his Rebbe and how he prayed at that time. Once he stole into the room unnoticed and hid beneath the bed. The holy Rebbe entered and closed the door behind him. He took his “gartel,” the traditional sash or belt used by Hassidim for prayer and preceded to fasten it about himself. The first time he wound the sash about his waist the whole house was filled with an awesome unbelievable light. The second time he tied the gartel winding it around, the light grew in intensity until the Ropshitzer could no longer endure it. He grew weak and found himself fainting. He called out in a loud voice. The author of the Hasidic work Maor va’Shemesh was a student of the Rebbe Elimelech. Once he asked the Rebbe Elimelech to be allowed to serve him, thereby learning directly from his Rebbe. Rebbe Elimelech conceded and asked him for a cup of tea. After preparing the tea, the student entered the room to give it to the Rebbe. Inside he saw the awesome figure of an old man sitting beside Rebbe Elimelech. He was overcome by fear, trembling and shaking so much so that he dropped the cup spilling the tea on the floor and ran out. Later Rebbe Elimelech saw his student and asked him why he hadn’t given him the tea he requested. He answered that he had brought it but when he saw the figure of the old man he was so frightened he spilled the tea. The Rebbe then said to him in Yiddish “Oy vey iz das kind voos ken nisht kiken dem taten in poonim arayn: Woe is to the child who cannot look his own father in the face.” That old man you saw was none other than our forefather Avraham peace be upon him! Did the Rabbis Invent the Noachide Laws ?